The Infinity Flex Display is Samsung’s version of an elastic OLED panel which will be the main ingredient of the foldable Galaxy smartphone. The elastic panel opens up to a larger 7.3-inch display, like a tablet and folds vertically, thus making it portable at the same time. At its annual Developer Conference in San Francisco, Samsung introduced the all-new Infinity Flex Display and the One UI which will make the idea of a foldable smartphone a reality. The South Korean company didn’t actually inveigle the working model of the flexible smartphone but instead revealed their final concept that will be pushed toward mass production. To start things off, the Infinity Flex Display is Samsung’s version of an elastic OLED panel which will be the main ingredient of the foldable Galaxy smartphone. The elastic panel opens up to a larger 7.3-inch display, like a tablet and folds vertically, thus making it portable at the same time. 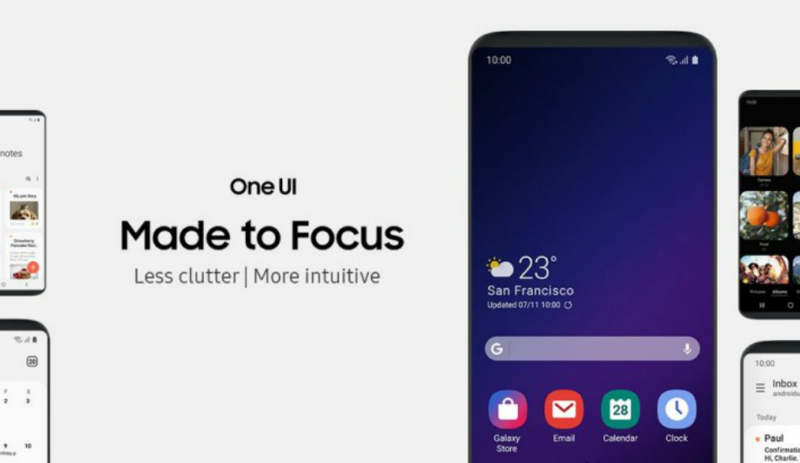 To make the experience seamless, Samsung has devised the One UI software in collaboration with Google and Android developers which is minimal and also ensures one-handed usage. The interface makes sure productivity is the ultimate priority and thus keeps the necessary pieces of information on the bottom half of the screen. Once unfolded, the UI on the folding smartphone changes to that if a tablet offering options to multitask with a larger screen. Samsung says that three apps can stay open at once on the One UI when the device is opened fully. The One UI will be available not only on Samsung’s foldable phones but also on non-foldable devices, meaning the Samsung Experience title will soon be replaced by the One UI. Samsung didn’t actually reveal the design of the foldable Galaxy device but said that mass production of the smartphone is currently being planned in the next few months. It remains to be seen how Samsung is going to replace the protective layer on the front which was previously glass. It has to be thinner than any existing display technology and also not wear off when being opened and closed for many hundreds or thousands of time during its lifespan.